One team will continue its recent Beanpot disappointment, while the other will earn a chance to compete in the finals for Beantown’s long sought after hockey prize. In last year's Beanpot consolation game, the Crimson and the Eagles battled for third place in front of primarily empty TD Garden seats. Last year, the Harvard men’s hockey team and crosstown foe Boston College skated in a game that no team ever wants to play. The 66th installment of the Beanpot Tournament, Boston’s annual clash featuring Boston University and Northeastern alongside the Crimson and the Eagles, proved unfruitful for both squads. 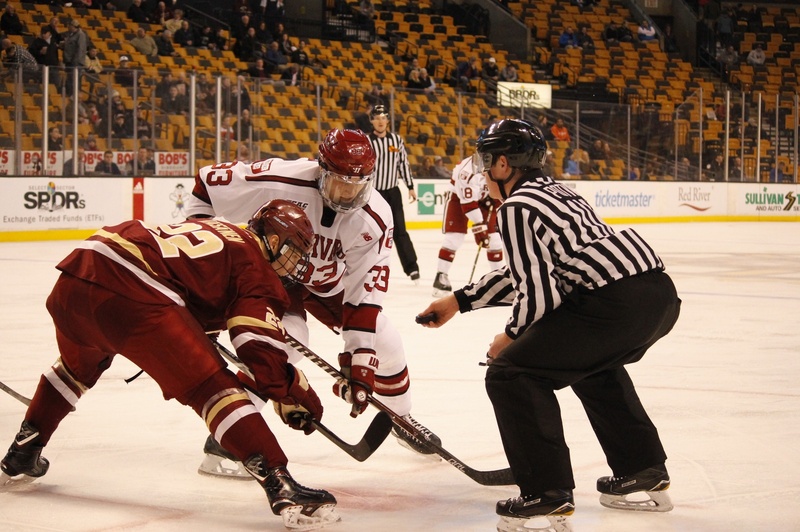 Losses in the semifinal round sent the Terriers and the Huskies to the championship, while Harvard and Boston College competed for third place in a mostly empty TD Garden. While the Crimson emerged victorious in overtime, the consolation game ironically provided very little consolation for coach Ted Donato ’91 and his group, who had hoped to defend their 2017 Beanpot title — the Harvard program’s first in 24 years. BC, on the other hand, endured its second consecutive fourth-place finish in the February sporting tradition after winning the tournament in six of the previous seven seasons. On Monday evening, the No. 19 Crimson (10-6-3, 7-5-2 ECAC) and the Eagles (8-12-3, 8-4-3 Hockey East) will meet in the Beanpot semifinal, both looking to avoid a trip back to the “early game” on the second Monday of the tournament. One team will continue its recent Beanpot disappointment, while the other will earn a chance to compete in the finals for Beantown’s long sought after hockey prize. For now, both teams’ sights are set on conference opponents — Harvard hosts Dartmouth and BC visits Connecticut on the Friday leading up to the Beanpot. But each participating school knows that the tournament, originated in 1952, carries a special gravity that can propel its victors to success down the stretch of the regular season and throughout postseason play. The Crimson and the Eagles will carry recent stretches of play with them into the semifinal. After mixed results to kick off the 2019 portion of its schedule, Harvard has nabbed a victory in four of its last five games and, with a triumph over the Big Green, will bring a four-game win streak into TD Garden on Monday. The successful stint includes wins against top-10 foes Quinnipiac and Clarkson and has seen Harvard pocket eight of 10 possible points in the conference standings. The most overt evolution of coach Donato’s squad — and the one that most explains the recent surge — is a renewed commitment to team defense. The Crimson struggled to limit goals against in the early part of the season, conceding an average of 5.33 goals per game through its first three contests, ranking dead last in Division I. Since a disappointing draw against then-ranked Princeton in early November, however, Harvard is tied for sixth in the nation in goals against per game (2.00). These defensive improvements have translated into winning results, as the Crimson sits top-10 in the country in goal margin per game (+1.06) and win percentage (.688) during the aforementioned span. Moreover, the team’s progress made in the defensive zone has polished the numbers of starting goaltender Michael Lackey (10-5-3, 2.20 GAA, .924 SV%). The senior has firmly cemented his role as Harvard’s number-one backstop after the team’s first few outings called it into question. In his 16 starts since the 4-4 affair with the Tigers, Lackey has held the opposition to two goals or fewer in all but four appearances. He has posted a 10-4-2 record, riding an impressive 1.79 goals against average and .939 save percentage — good for top-10 and top-5 in the NCAA, respectively. Harvard net-minder Michael Lackey has put forth a stellar season to date despite a shaky first few starts. BC, the home team in Monday’s tilt after winning the deciding coin flip, is ranked in the bottom 10 in goals per game (2.30) ahead of its matchup with UConn. Coach Jerry York’s squad will therefore have its hands full trying to solve the revamped Crimson defense and net-minder. Scoring struggles have contributed to the Eagles’ uncharacteristic sub-.500 record. Entering Friday’s game against the Huskies, BC has earned just one win in its last five contests (1-3-1) and two wins in its past nine (2-6-1). Seven of those nine matchups, though, were against teams currently ranked in the USCHO top 20. So the Eagles are well-versed in competitive adversaries. In the Beanpot semifinal, the Eagles hope to put an end to one of college hockey’s more startling streaks: they have failed to beat a nonconference opponent in the regular season in 25 attempts (0-21-4) dating back to Nov. 13, 2016. In order to do so, the Chestnut Hill dwellers will need to contain a potent Harvard attack. The Crimson scores the 10th-most goals per game in Division I (3.26) due to speed up front and abundant offensive firepower on its blue line. 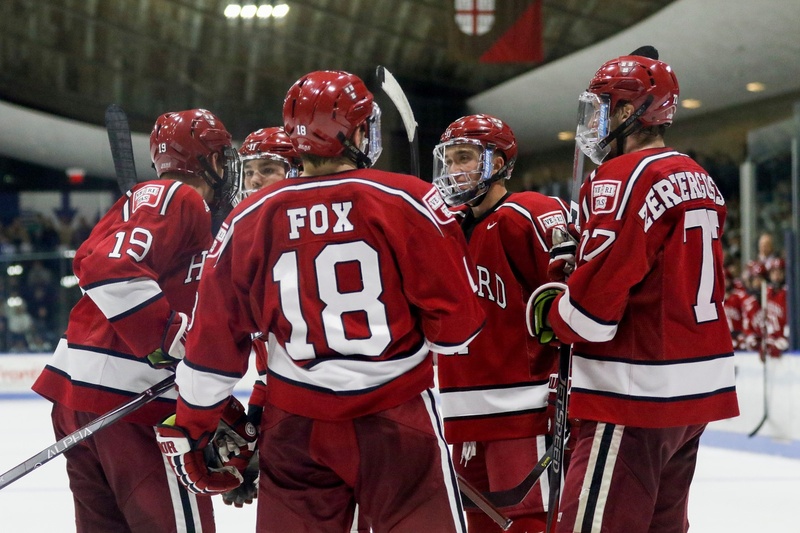 Harvard’s primary facilitator is junior defenseman Adam Fox (7–20—27), whose 1.05 assists per game and 1.42 points per game place him in the top three nationwide. Fox is also top-three in powerplay assists (0.58) and points (0.79). Zerter-Gossage (10–4—14) paces the Crimson in goals, although coach Donato benefits from many offensive contributors, many of whom are underclassmen. Sophomore defenseman Reilly Walsh (7–11—18) and rookie forwards Jack Drury (6–11—17) and Dornbach (4–18—22) help fuel the team offensively. These young guns do not anticipate being fazed by the magnitude of the Beanpot, nor should they. In a November matchup with Cornell at Madison Square Garden — arguably the grandest stage in American sports — underclassmen were responsible for seven of the team’s 12 points logged in the 4-1 victory. The Crimson's first powerplay unit is among the most skilled — and the most effective — man-up group in the country. 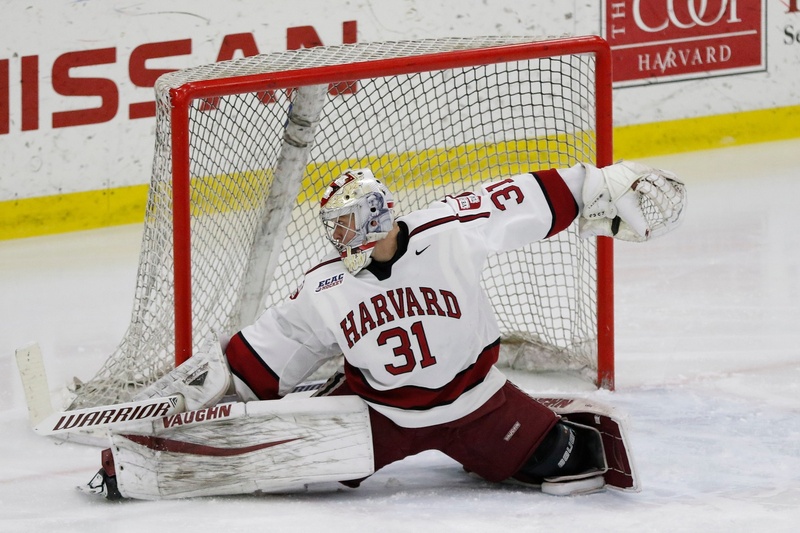 These Harvard icemen, who are valuable pieces on the nation’s most effective powerplay (35.9%), will present problems for the Eagles’ junior goaltender Joseph Woll (7-11-3, 2.28 GAA, .922 SV%). In the face of his team’s woes, Woll has still played well this season, posting the best individual numbers of his career. The backstop will look to forwards like David Cotton (15–9—24) and Julius Mattila (7–9—16) to continue to lead by example, and to highly touted attackers such as former Harvard commit Oliver Wahlstrom (6–4—10) to increase their production, in order to muster more goal support from the skaters in front of him. Despite the many factors that will contribute to the outcome of Monday’s Beanpot semifinal, a Boston school’s fate in the storied tournament often comes down to a single play. The Crimson’s pair of sudden-death deciders in the 2018 Beanpot — first a double-overtime loss to BU and then a third place clincher over the Eagles — proved that much. And while No. 12 Northeastern, fresh off its first Beanpot title since 1988, will enter as the slight favorite, any of the four teams can seize local on-ice supremacy with a tournament win. 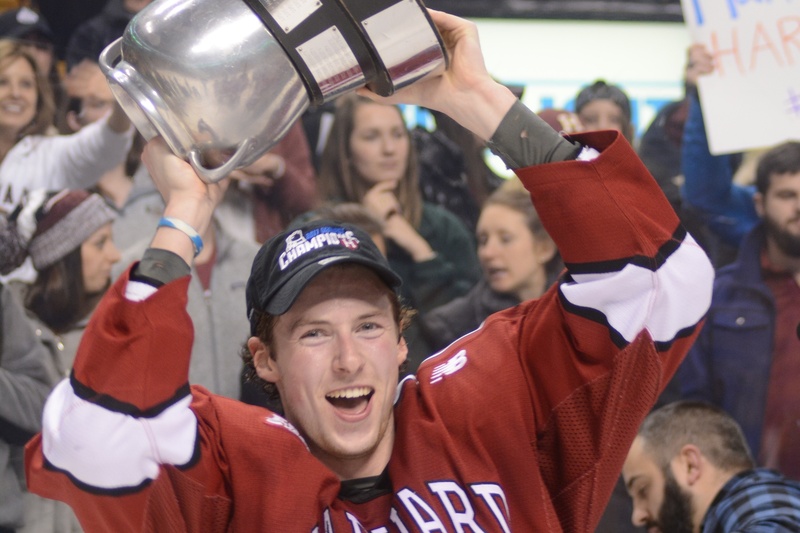 For some players, this year marks the final time they will descend upon TD Garden on the first two Mondays of February; for others, the 2019 Beanpot is their first glimpse of the ritualistic spectacle that captivates Boston at this time of year. Either way, the stakes are high and promise to deliver ample drama in this year’s local hockey classic.